This past weekend we had our first race of the season. We'll get to that shortly, but first we'll back up a few days. Since we'd finished working on the car a week before the race, Alan and I towed it up from San Diego to Orange County so we could tow it to the lake bed on the 17th. Mark was going to be delayed getting up there and we needed it to be inspected. 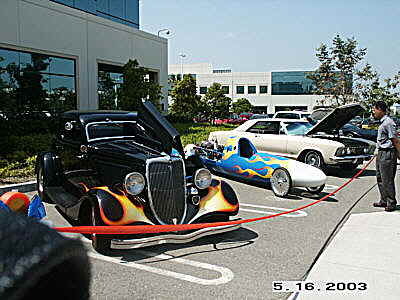 It also allowed Alan to take the car to his work, for a car show. It was the only car that had to be trailered in. It drew a lot of attention, with many people remarking how small the driver's compartment is. On Saturday morning, we detoured up to Fullerton to show the car off to Scott at Ford electronics, who has helped us with electrical bits, from time to time. Then we drove up to the lakebed. 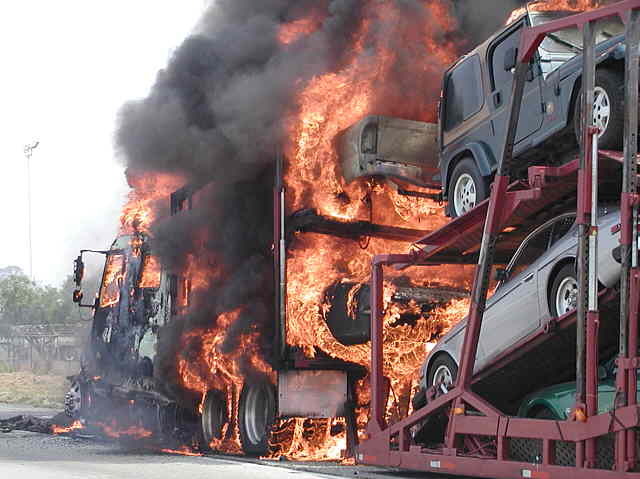 On I15, just before the 60, traffic slowed because of a vehicle fire. We hopped to have a better weekend than this truck driver was having. 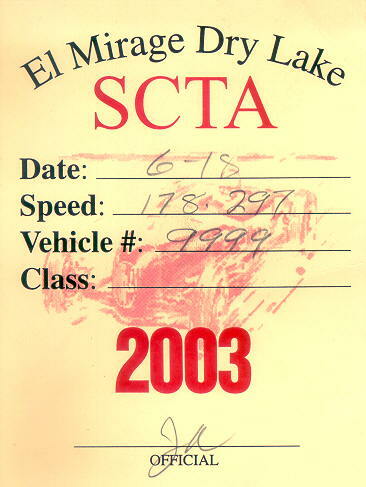 At the lakebed, there was a very long line waiting for inspection and it took us more than an hour before getting inspected. The weather wasn't looking very good either. The wind was around 20 mph, and for a while, we were even getting some rain. By the time Mark arrived, though, everything had cleared up. Late Saturday afternoon, I went to check out the timing equipment that would be timing the event the next day, and discovered that there were some pieces missing. I wound up driving to Victorville to buy a replacement power supply for the timing clock. When I returned, I was surprised to see Richard from Southwest Superbikes standing in our pits. He had flown out from Texas to watch us race with the motor he loaned us. Sunday Morning Alan took my place in the timing stand while Mark and I got the car in line. We were 13th overall last year, which let us run very early in the meet. I hadn't driven the car for almost a year, so I was a little nervous suiting up. Once I was in the car, there was too much to do, so I didn't have time to think about being scared. This motor doesn't have a starter, so we were going to have to push start it. We discussed doing a warm up lap, but Richard said to just go for it. This picture was taken from www.scta-bni.org web site. WOW, did the car ever take off. Alan and Mark had warned me that the first couple of gears would go by very quick. I didn't even try to read the tach, I just shifted when it felt right. I got into fifth gear way faster than I expected, and then into sixth, with lots of track ahead, but disappearing rapidly. Without an indicator, I check shifted one extra time to make sure I was in the final gear. The winds were strong but from the back and I only got pushed around a little, nothing the car couldn't easily handle. Then I was passing the finish, and I knew it was a great run. I checked the tach, 9400 rpms to confirm the engine performance, then hit the parachute button. I love this new chute. Plenty strong enough to slow the car, but not so big that it strains the driver. When I came to a stop at the side of the track, I could smell smoke, but with a new exhaust system that's expected, so I wasn't too worried. I had come to a stop far from any patrol or other team so I just started packing up the pieces waiting for Mark to arrive. When Mark pulled up he was all smiles and waving his arm in the air. Too bad we both forgot about the camera. I asked Mark if we needed to go to impound and with a big grin, he said, "Oh yeah!". 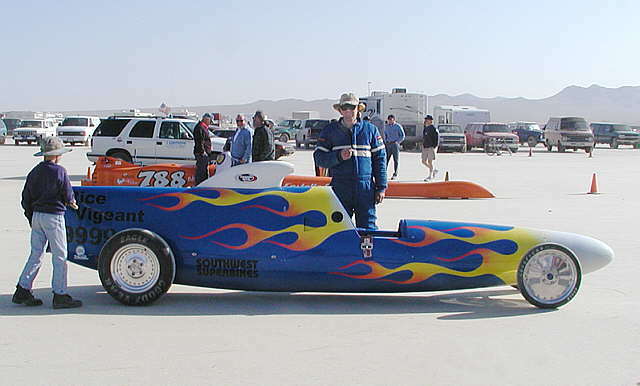 The old H gas lakester record was 172.5 mph, and I had just gone, 178.297 mph. Driving the car back to the pits I got lots of waves from spectators and racers, many of whom knew I'd just set a record. Steve Toller, who had traded records with us years before gave me a high five as we went by. Record inspection was a little bit new to me. I hadn't been there for about 10 years. Right in front of us was a Hayabusa powered streamliner that had just set a record at 247 mph, the fastest speed of the meet. (can you believe it, a 4 cylinder motorcycle engine beat all the V8's. That's why we're using that motor too.). One part of record inspections is measuring the size of the engine. Fortunately, Rick Yacoucci, the driver of the streamliner, used his special engine measuring tools to measure our engine, saving us the trouble and expense of tearing it apart. This motor has now been sealed so it doesn't need re-measuring until we tear it open. I replaced Alan in the timing stand so he could work with the car's data computer. Not everything went good. The onboard data computer software lost our run data, so it was a good thing I checked the tach. We'll need to find a solution to that problem. It had lost data before, but this time the owner of the company was standing there when it happened. We won't be changing anything major on the car before the next race, so we're going to take a couple of weekends off to recuperate from the work weve been putting in. The next newsletter will be after the June 8th race.